An account of the National Schools Cross Country Championships 2013. The writer is a member of Cross Country and Press. 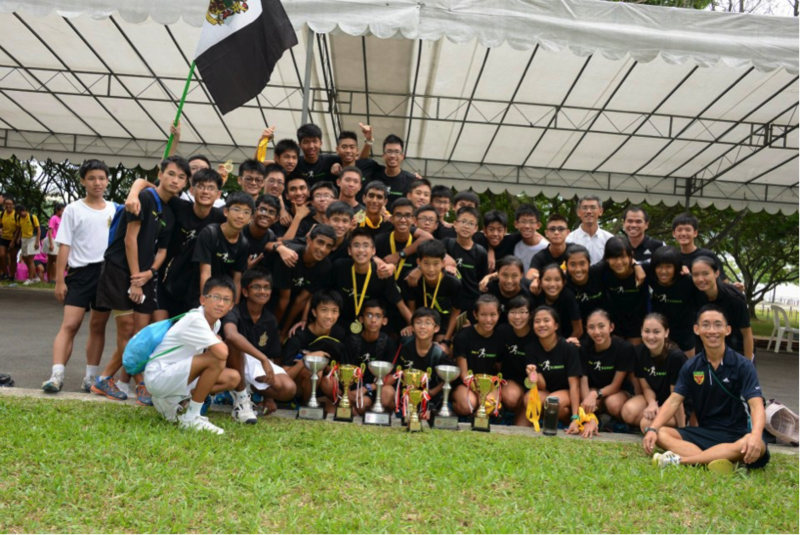 Photos from Today Online and Jolene Quek (13A01C). 27 March 2013 has long been on the calendar for many of us not because of the Maths CT1 paper, but because it was the day which would mark the culmination of all the time, energy and effort we had invested into the gruelling trainings – the National Schools Cross Country Championships 2013 to be held at Bedok Reservoir. It has been no secret that our aim was nothing short of the double Gold, and both our A boys’ and girls’ teams had been quietly confident going into this penultimate race of the season, having established ourselves as the school to beat in the 3 previous races. But we were not about to let the danger of complacency set in. The focus was on maintaining our position and working on getting enough sleep, nutrition, and hydration, especially with the horrible weather in the weeks leading up to the race. It was 7am and the previously quiet and tranquil environment of the reservoir gradually grew in activity as competitors and supporters alike began to stream into the area and teams began to head off in different directions for customary warm-up routines – the whole place was abuzz with excitement as everyone eagerly anticipated the start of proceedings. The A Boys kicked off the day with the first race scheduled at 9am, a distance of 4.3km that was exactly one round of the reservoir. 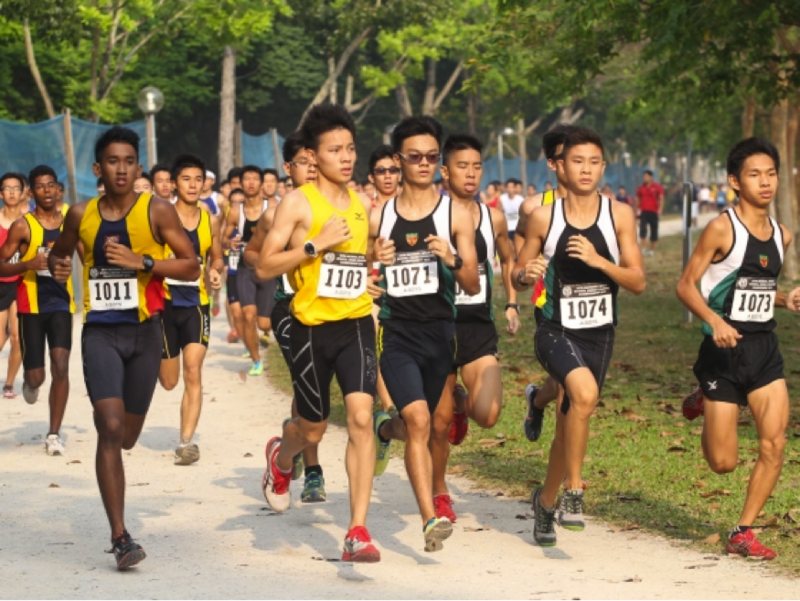 While the pre-race favourite Karthic from Hwa Chong quickly established a sizeable lead, no one was willing to follow his punishing pace as he was clearly a class above the rest. Barring him, the lead pack consisted of our top 4 RI runners in Yu Jie, Bryan, Jia De and Jonathan and an ACJC runner as the pace quickly settled down. We did not have an actual race plan, but if there was one, it was to run together and that was exactly what we did. This “running formation” of sorts was sustained for most of the race and it was only possible because we had practiced running together at such a pace in training so many times that it felt almost natural to do that in the race. When we finished our race, the A Girls were there to congratulate us before they reported as their race was the last race of the day, starting at 9.50am. Having the A Boys team championship in the bag, we were rooting for our girls’ team and hoping that they could wrest the team championship back from bitter rivals Hwa Chong Institution who had won it in 2012. 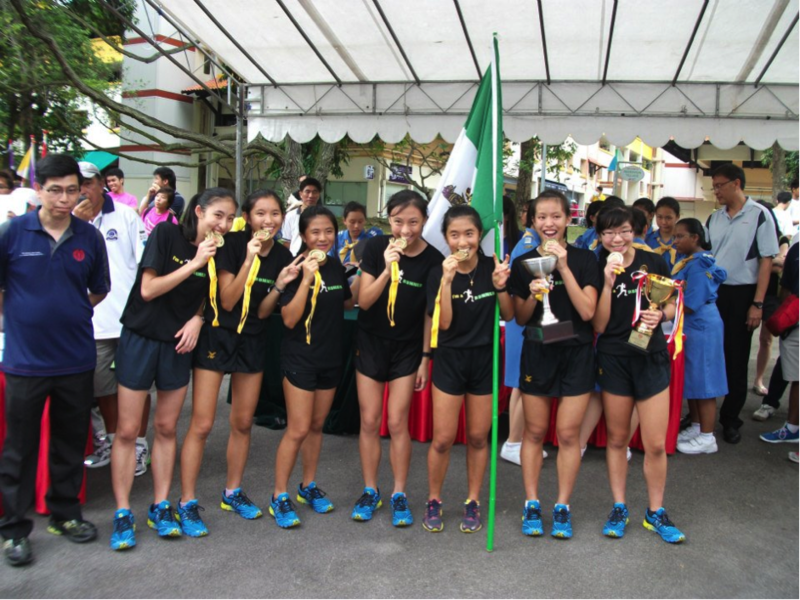 Our girls’ team had displayed ruthless dominance in the previous race by sweeping the top 4 individual positions to record a perfect score of 10, and they repeated their sheer superiority led by Jolene Quek, who stopped the clock as A Division Girls’ Champion in 14.11.79 for the 3.6km route. She was followed closely by Janielle Lim in 2nd, Tan Wan Xin in 3rd and Adeline Bee rounded off the legendary finish in 4th. Mary-Lisa Chua and Daphne Chia finished 8th and 9th respectively to ensure that all 6 girls finished within the top 10 places. This is the first time in recent memory that any team has swept the top 4 positions and perhaps possibly the incredible unlikelihood of this occurrence means that our A Girls could probably have just walked themselves into the history books of Inter-School Cross Country with a performance that deservedly stole the limelight. 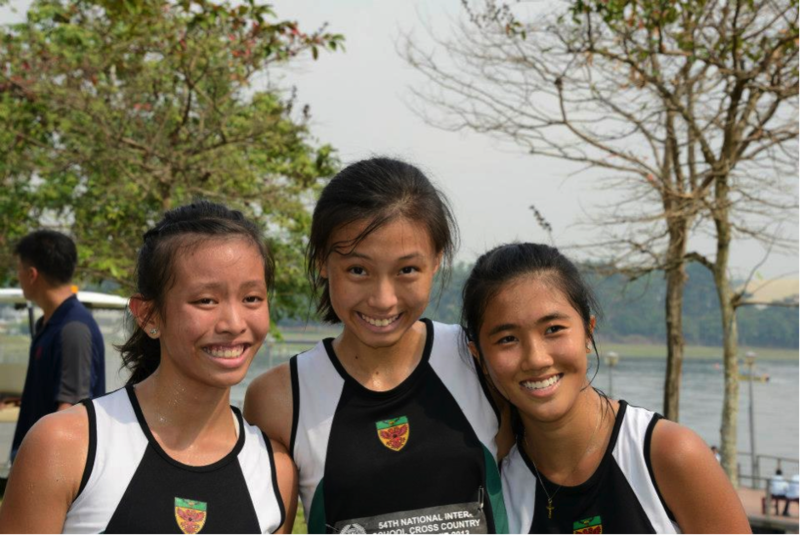 Jolene Quek, Tan Wan Xin, and Janielle Lim complete the podium – tired after the race, but who says you can’t smile? 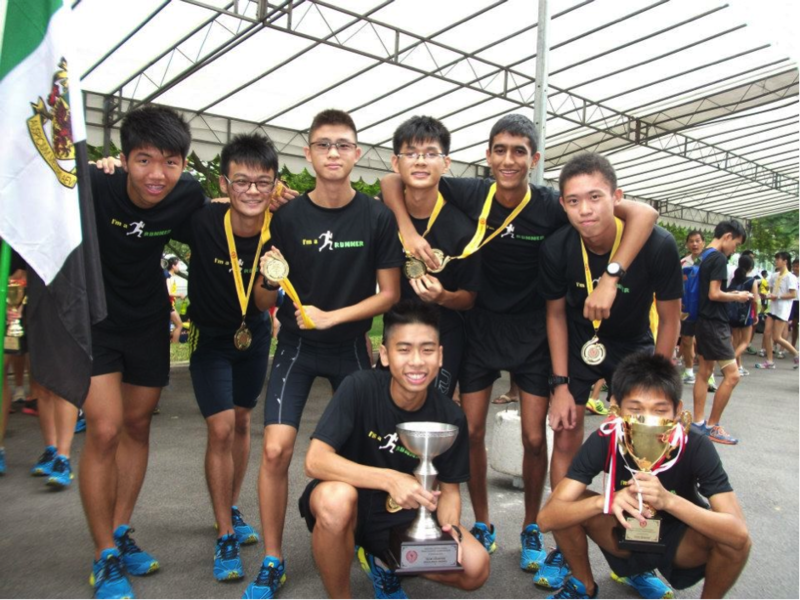 With RI also taking home the A Division Boys’ and B Division Boys’ team championships, National Cross Country Championships 2013 was a good day for RI who dominated it with 3 out of the 6 team titles, winning 3 out of a possible 4 on offer. RI Cross Country thanks our coach, Mr Steven Quek, our teacher-in-charge Mr Tay Meng Kiat, Mr Vincent Quek and Mrs Ramesh from the Year 1-4 side, Madam Or, the RV Cross Country teacher-in-charge, and the many alumni who come back to help us with training, as well as the seniors and student supporters.